“Here, I can help you with that. How often have we made remarks such of these to seniors, with the very best of intentions, of course? We want to do whatever possible in order to help our aging loved ones, to keep them safe and to take care of them in the same way they took care of us when we were younger. Yet, there’s a concealed danger in trying to do too much for older individuals and depriving them of the ability to do as much as possible for themselves – the threat of damaging senior self-confidence and sense of meaning and purpose in life. Seek advice. Being granted the occasion to share insight and wisdom is a great boost to an older adult’s self-regard, and there’s definitely a lot we can learn from older adults. Find little ways through the day to ask the senior’s advice on how to make a perfect pan of lump-free gravy, how to stop the draft coming in under the windowsill, how to comfort a cranky toddler, etc. Seek hands-on assistance. 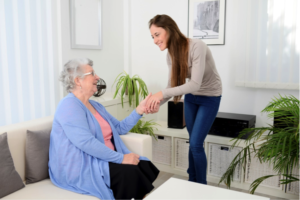 As in-home caregivers, it’s our duty to help seniors with assorted needs, but we also understand the value of allowing seniors the chance to perform helpful duties as well. It doesn’t need to be a monumental task to maintain the sense of being needed. Pay attention to the senior’s cognitive and physical boundaries, and ask for his/her help accordingly. For example, a person who is in a wheelchair can sit at the table and help with cooking and baking related tasks, polish silverware, or sort tools in a toolbox. Verbally show your respect. While you may assume the person understands how you feel, it’s a fantastic feeling to be told how much we mean to one another. Take time to state specific ways the older individual has helped you in some way and how much you appreciate that help, from learning to ride a bike or drive a car, to parenting skills, to the ability to paint or draw or carve wood. Be truthful in your compliments, and speak them often, from your heart. A trained in-home caregiver, such as those at Visiting Angels of San Jose, is adept in sustaining the delicate balance between providing care for seniors and improving their sense of purpose and meaning. Contact us to learn more about our home care services, view our full service area or to schedule a free in-home personalized consultation for your senior loved one.